Few accidents are more devastating than a head-on collision. Head-on crashes, also called front-impact collisions, occur when two cars traveling toward each other collide head-to-head—often at high speeds. Due to the severe impact of a head-on crash, the vehicle’s safety features may not be enough to protect its passengers, causing disabling or even fatal injuries. Research has shown that front-impact crashes are far more likely to be fatal than other types of collisions. The Insurance Institute for Highway Safety (IIHS) reports that of the 1,041 people killed in car accidents in Tennessee in 2016, over half of them were involved in a head-on collision. On average, frontal impacts accounted for 15 driver deaths per million registered vehicles in 2016, compared with six deaths per million in t-bone crashes and two deaths per million in rear-end accidents. Distracted driving. Although texting and cellphone use are major causes of distracted driving, any activity that requires a driver’s eyes, hands, or concentration is a potential distraction. Drunk driving. Drunk drivers are unable to process and respond to road hazards, making them likely to collide with other vehicles head-on. Over 60% of drivers killed in Tennessee car accidents in 2016 had a blood alcohol concentration (BAC) over the legal limit. Drugged driving. Drivers impaired by illegal drugs, sedatives, prescription medications, or over-the-counter remedies may experience vision problems or drowsiness that causes them to drift into another lane. Drowsy driving. It only takes one night of poor rest to affect a driver’s coordination and concentration. A fatigued driver can cause an accident even if he or she does not fall asleep behind the wheel, especially if he or she turns the wrong way down a one-way street. Reckless driving. Speeding, erratic behavior, driving too fast for conditions, and other reckless actions are often associated with head-on collisions and make the effects of these crashes more severe. Improper passing. Drivers may misjudge the distance needed to pass a slow-moving vehicle, putting them in the path of an oncoming car. A driver who is “stuck” in the wrong lane while passing may speed up to overtake the vehicle and return to the correct lane, striking the oncoming vehicle with even greater force. Wrong-way accidents. A driver may enter the roadway from the wrong direction, sending him or her into the path of several oncoming cars. Inexperienced drivers, drunk drivers, and older drivers are especially likely to cause wrong-way crashes. Vehicle defects. In some cases, a defective vehicle or auto part can cause drivers to lose control of their vehicles. If a vehicle malfunction caused the crash, victims can hold car manufacturers or auto parts distributors liable for the costs of the accident. A person’s life may never be the same after a head-on collision. A victim may be unable to work, depend on lifelong care, or lose the ability to enjoy many daily activities that others take for granted. 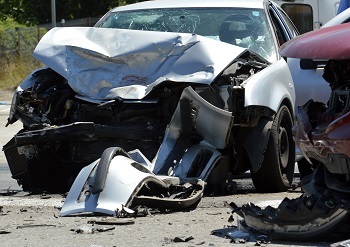 For this reason, victims who suffer a front-end crashes should speak with an attorney as soon as possible to determine who was negligent and how to get fair compensation for their losses. The attorneys at GriffithLaw provide car accident injury consultations at no cost to the victim. In addition, our legal fees are paid with a portion of the settlement we secure for you, so you will not owe our firm anything until your case is resolved. To learn more, simply fill out the short contact form on this page or request a free copy of our book, The 10 Worst Mistakes You Can Make With Your Tennessee Injury Case.